Instead of reducing SOE debt, the government has been boosting purchases from SOEs and stymieing private-sector competition to make that debt more manageable. 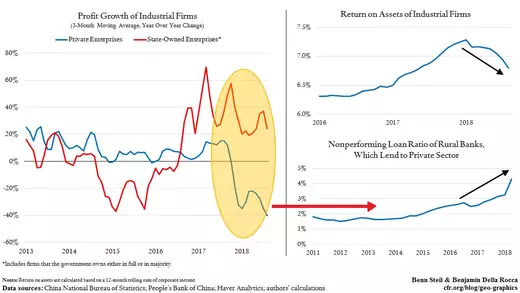 The “focus is no longer on deleveraging,” explained Tsinghua University economist Zhu Ning, “but on transferring leverage from one sector to another”—that is, private to public. Whereas the People’s Bank of China has cut reserve requirements four times this year, large state-owned banks, which dominate deposit-taking, are channeling funds—as they always have—overwhelmingly to SOEs. Meanwhile, the government has clamped down on shadow-bank lending to private firms and forced many to close. The net result of a systematic shift in policy toward support for SOEs has been plummeting private-sector profitability. This in turn has, as shown in the bottom-right figure, increased nonperforming loans at rural banks, which lend primarily to private firms. China’s new strategy is buoying the economy in the short-term, but undermining it in the long-term. As shown in the top-right figure, return on assets in industrial firms is falling as business shifts to the less-productive state sector. This fact bodes badly for both future growth and debt levels.